During an interview on CNN’s “State of the Union,” Hoffa said companies like Apple have a responsibility to put Americans back to work and that encouraging them to do so should be part of President Barack Obama’s jobs plan. Hoffa, who presides over the Teamster union’s approximately 1.4 million members, said Obama should institute a tax incentive to encourage companies to stay and spend money in the United States. Obama is set to address a joint session of Congress on September 8 to lay out his plan to spur job creation. When asked about the high price of labor and health care, as well as environmental regulations in the United States, Hoffa said it is still possible for companies to be successful within the country’s borders. 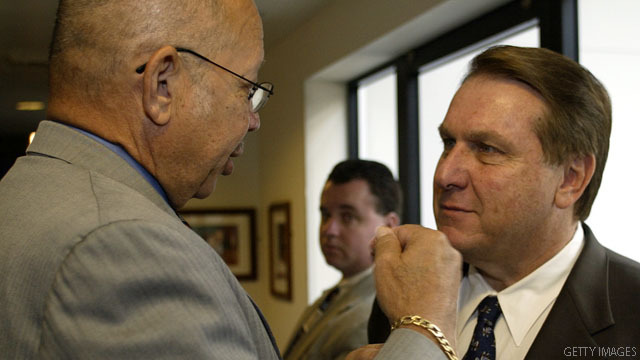 Despite some disagreements with Obama, including his support of free trade agreements, Hoffa said he will support the president in 2012. “When the alternatives are Sarah Palin and Michele Bachmann and Rick Perry, it makes it real easy to make a decision,” Hoffa said, referencing two of the declared Republican presidential candidates and Palin, who has not made a final decision. The new republican middle class will be made up of people working for less than the minimum wage, because they baggers want to eliminate it. People living in the new republican middle class will be living in a cardboard box, breathing brown air, and drinking water that glows in the dark. Of course, they will only have to work 80 hours a week. I believe Willard the birther dropped out of school in the third grade. American companies will come back to the U.S., eventually. Labor costs and the costs of other resources are already rising in emerging economies. As capitalism spreads it also raises standards of living globally and makes it more and more difficult to find pools of cheap labor. But, of course, this is not going to happen tomorrow. "Obama should instutite a Tax incentive to encourage companies to stay and spend money in the United States". Obama wants to Tax the rich and give it to the poor. The problem, Jimmy, is companies don't have enough money to support everybody and make a profit, of what they need to do to keep people worknig. So since the Government demands Taxes that are exhorbant, companies go off shore. Companies need to make a profit to stay in business. Our Liberal friends got too many regulations in place for the average business to keep up with so they moved to China. You can lead a horse to water but you can't make hime drink. If Hoffa would take Trumka with him to Mexico or maybe Russia the economy would greatly improve. It is Obummie's job killing agenda funded by the unions that keep companies from spending money and creating jobs. Just look at Obummie killing the Boeing plant in SC. Look at Gibson guitars being harrassed. Look at all the jobs killed by Obummie Care and the EPA. When Obummie is replaced, the country will be back on track !!!!! When grocery stores in Los Angeles are still planning for a strike over worker having to pay an average of 100.00 per month for healthcare, no union rep should ever comment on unpatriotic moves. It's the player's union that has had the NFL and now thew NBA out o strike for these over paid children. Perspective is needed if this country is ever to come back. Mr. Hoffa should take a very basic course (probably a simple computer course) on economics. Mr. Hoffa needs to become educated, which might be to much to hope for. And these same corporations could care less that the markets are “crashing”; the jobless rate rises; or the middle class suffer. As long as they can get away with “overworking” those that are already working, they will NOT hire. When those “overworked” and sometimes “underpaid” workers get “fed up” and “luckily” move on, the corporations will REPLACE them with the SAME low wages with more desperate people longing to work. As long as these BIG CORPs can keep their BIG BONUSES – it’s all good!! They ARE NOT patriotic and where is the so-called RIGHTEOUS-Right, who claim they are VERY PATRIOTIC; why aren’t they calling them out???? Hmm, I wonder!! And before anyone feels they need to call me out on this, I know the BIG CORPS are overworking their workers because I know MANY people that fall in that category. And the company – to name ONE – Capital One!!!!!! Hmm, I wonder how much Capital One paid in taxes and who is “protecting” them with MORE tax breaks???? To: RAY E. GEORGIA – If these large corporations are NOT making a profit, how is it that the CEO'S get millions of dollars in bonuses? If they are not making money, how is it that their stocks keep going up on Wall Street? Yes, they DO NEED TO BE TAXED! Look at what happened when they were given lower taxes and MANY LOOPHOLES....they moved overseas! Taxing the HELL OUT OF THEM if they have operations overseas WOULD BRING THEM BACK if the stipulation of the regulation stated they would get a lower tax break for production here in the U.S. So, you see, the tax regulation would have to be twofold. High taxes for overseas operations & products/services, tax break for returning production/services to the American people. MAYBE provide a FEW LOOPHOLES for having business HERE – NO LOOPHOLES for anything overseas. “When the alternatives are Sarah Palin and Michele Bachmann and Rick Perry, it makes it real easy to make a decision,” Hoffa said. Notice that he did not include Romney in that sentence. Hoffa knows, as do most people, that Romney is only pretending to be a hard-right conservative so that he can win the Republican primary. Romney, like Obama, is a middle-of-the-road politician, although he is not good at making speeches or running political campaigns. Both Obama and Romney believe in global warming. They even have the same health care plan. That's a charge I can agree with. Corporate America, has sold out the American worker, in their greed. Today, everything is either made off shore, or foreign companies are making their products here, or buying up American companies, making them into global entities, that have no allegiance to any country. @ terry,va I see you've got nothing to do AGAIN today. You should really get back on your meds! Only used the President's name incorrectly 4 times in your post, what's the matter? To argue with you is a waste of time as you will NEVER figure it out for yourself. Anthony "they even have the same health care plan"
They only have the same plan because the plan Obama signed was the version of the plan that could get passed, not the original version of the plan.